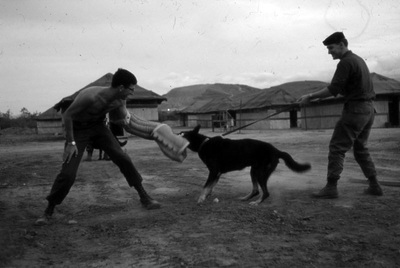 In 1960 the US advisers to the the South Vietnamese military recommended that a dog program be established. Sentry dogs would protect military bases and scout dogs would enable the troops to attack the VC. The program was a huge failure. 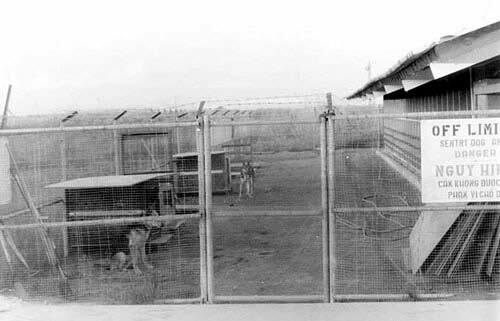 The dogs had major health problems, the majority died from malnutrition. 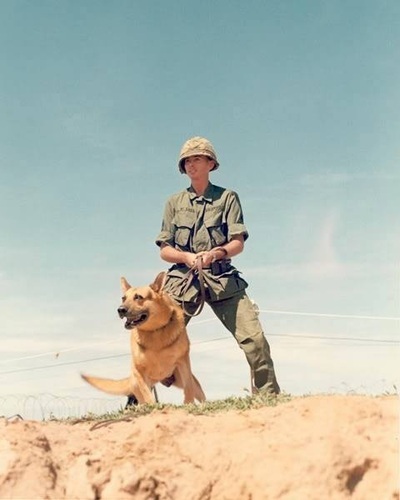 Many of the Vietnamese handlers were Buddhist and did not develop a relationship with their assigned dogs. 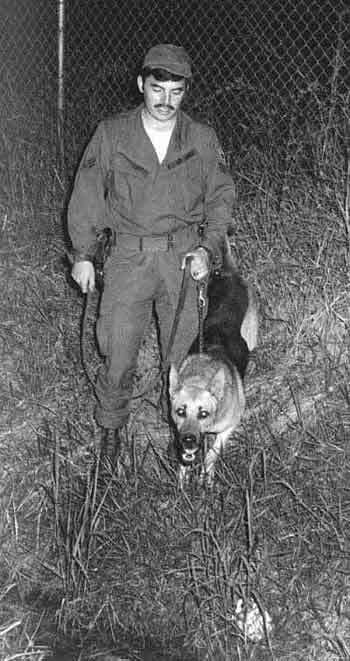 The cost to feed a dog was more than the cost to feed the handler. Within a few years, several hundred dogs had been turned over to the Vietnamese military. 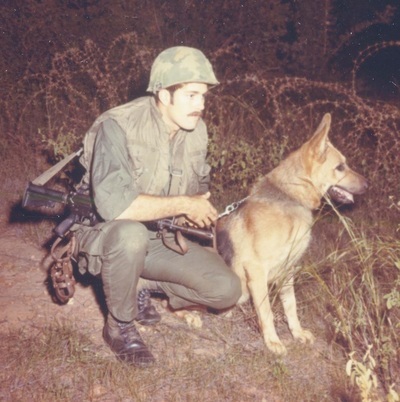 At this time the only Air Force involvement had been supporting (with the US Army ) the Vietnamese Sentry Dog program. The Vietnamese military never had an effective dog program. 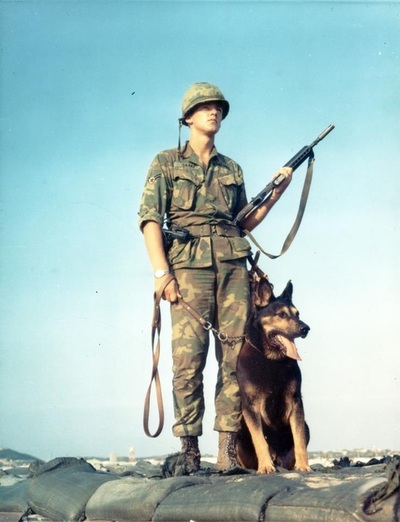 The communist military strength and firepower in Vietnam increased. 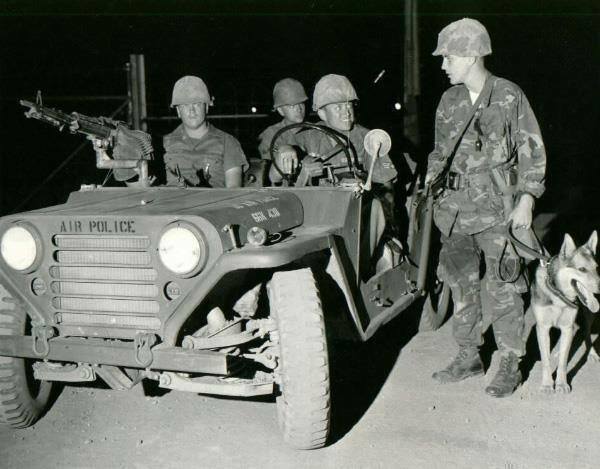 As a result, PACAF began a buildup in the area with the addition of troops and better arms and equipment. Top Dog was a program in Vietnam to test Sentry Dog's for base security. 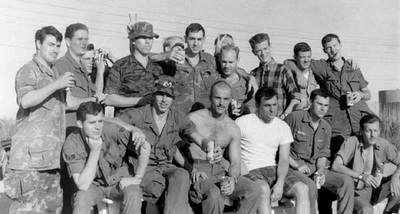 It was launched two days after a successful Viet Cong attack (July 1, 1965) on Da Nang AB Air Base. 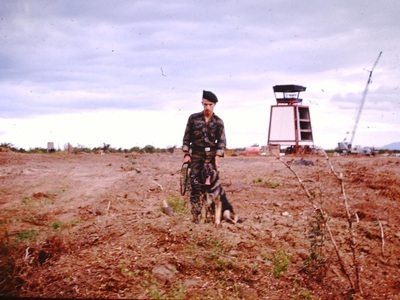 Forty dog teams were deployed to Vietnam for a four month test period. 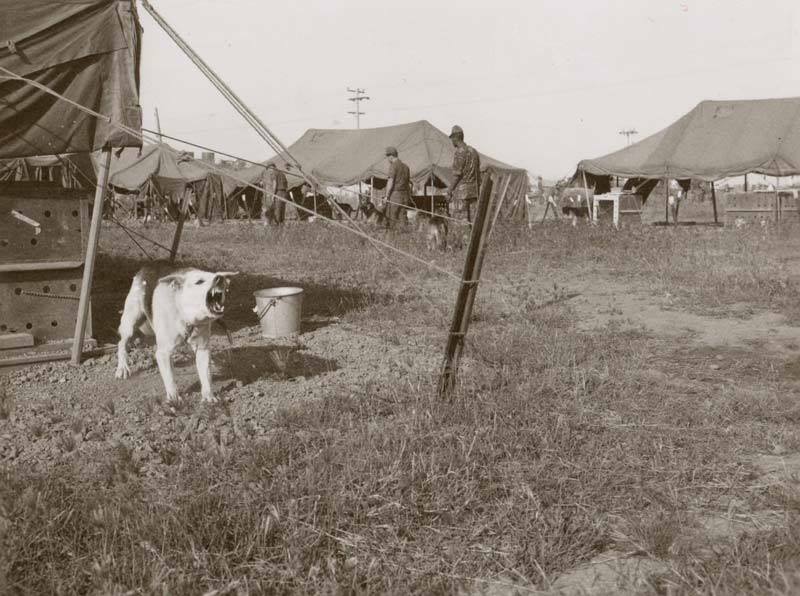 Dog teams were placed on the perimeter in front of machine gun towers/bunkers. 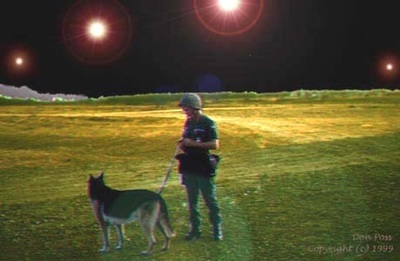 The sentry dog teams were tasked with early warning. An alert was followed with a rapid response of reinforcements. The test was successful. Handlers returned to the US and dogs were reassigned to new handlers. 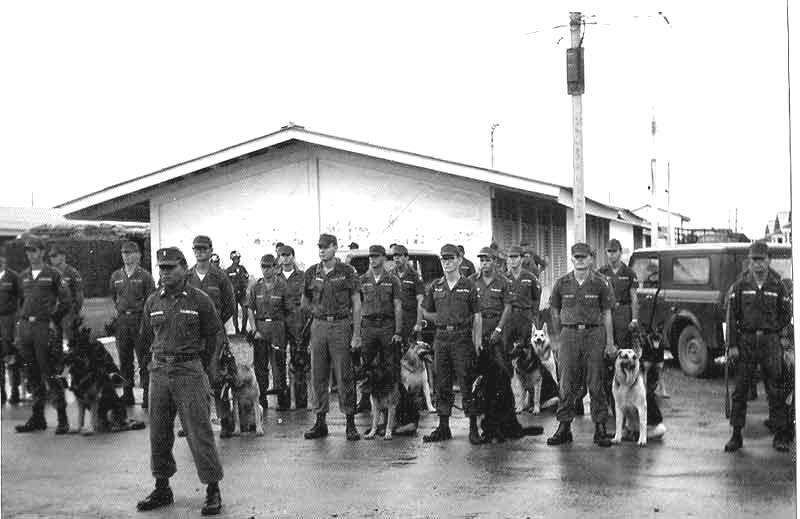 The Air Force immediately started to ship dog teams to all the bases in Vietnam and Thailand. 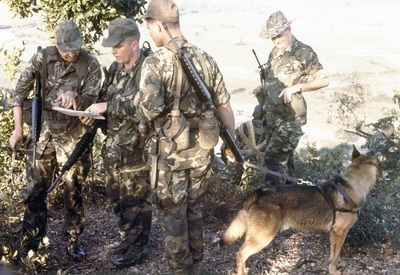 That the test was successful would have been no surprise to anyone knowledgeable about the capabilities or military history of dogs. One of the early arguments was that dogs could not handle the tropical heat. 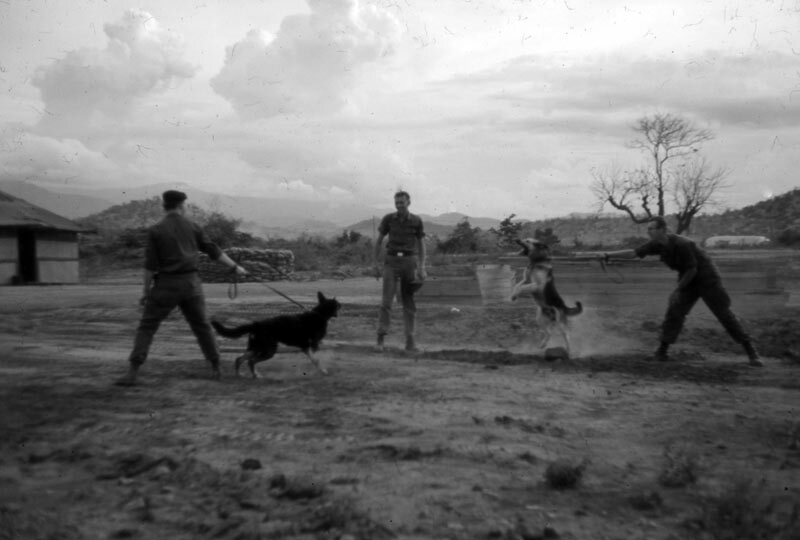 The fact that dogs had been used in South-East Asia during WW II was ignored. 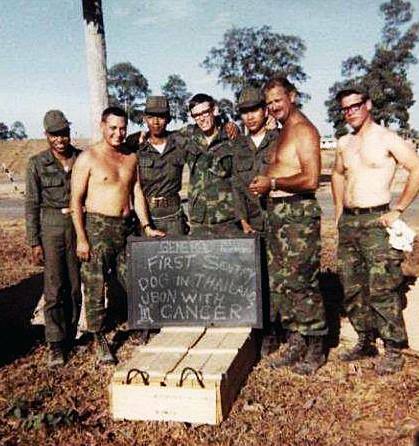 Some in the military have the ability to remember past programs and recycle them . Of course they often take the credit for the new program. That credit is then used that for promotion. 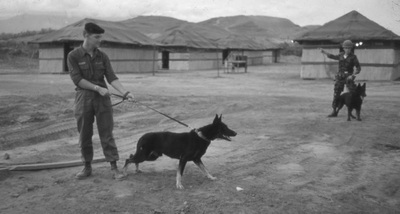 The Viet Cong forces feared all military working dogs. 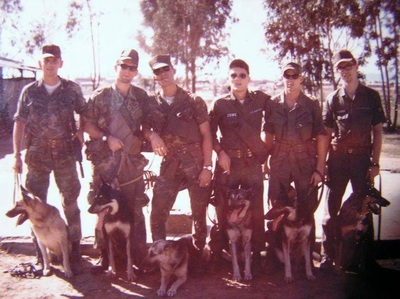 A bounty was placed on the lives of dog teams. 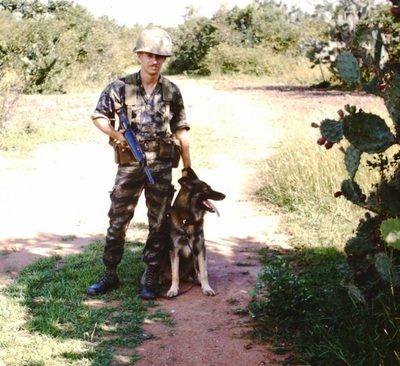 Interestingly, the bounty was higher on the dog than the handler. 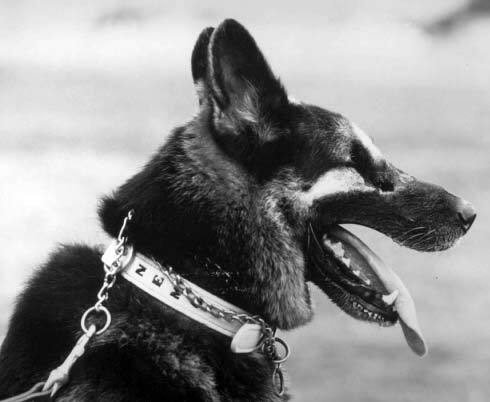 The tattooed ear was proof of the dog's death. 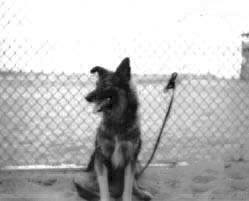 A leash was proof of the handler’s death. 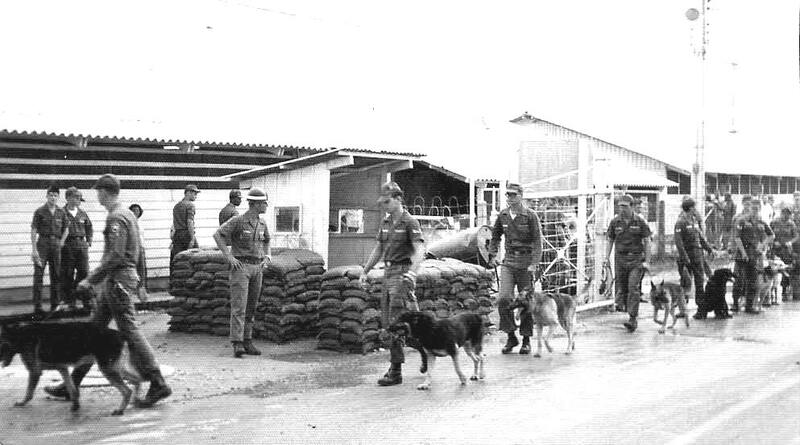 The buildup of forces in Vietnam created large dog sections at USAF Southeast Asia (SEA) bases. Four hundred sixty seven (467) dogs were eventually assigned to Bien Hoa, Bien Thuy, Cam Ranh Bay AB, Da Nang AB, Nha Trang, Tuy Hoa, Phu Cat AB, Phan Rang AB, Tan Son Nhut AB, and Pleiku AB Air Bases. 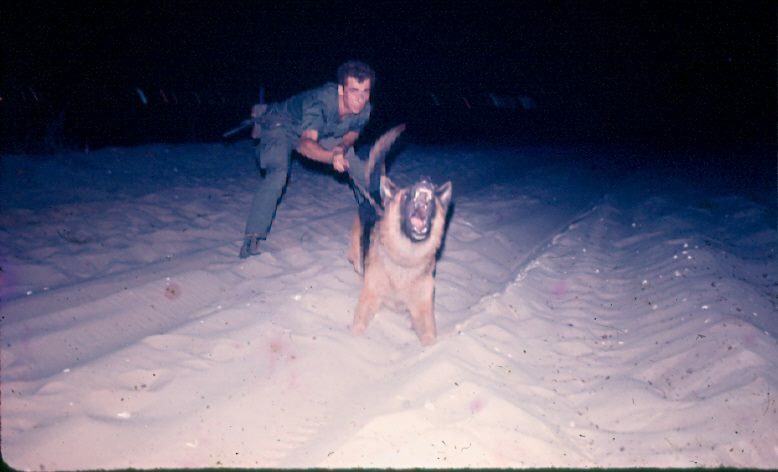 Within a year of deployment, attacks on several bases had been stopped when the enemy forces were detected by dog teams. 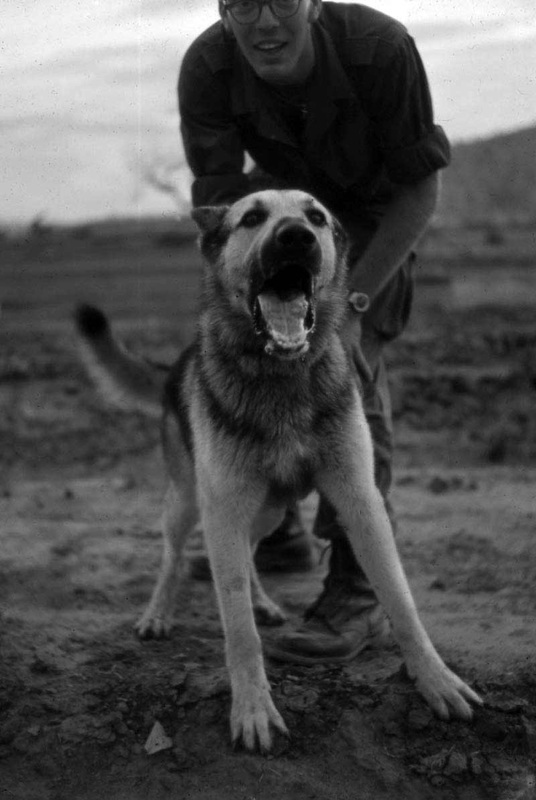 Captured Viet Cong told of the fear and respect that they had for the dogs. 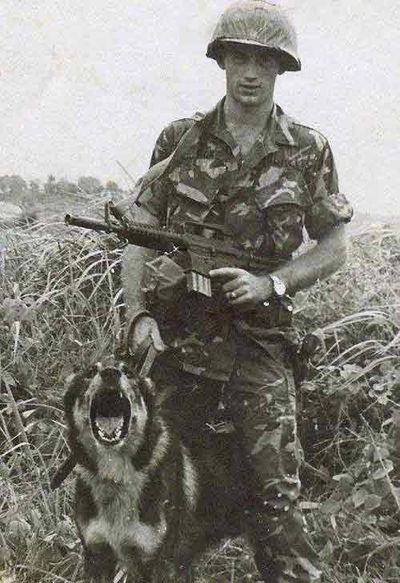 The Viet Cong had even placed a bounty on the handlers and dogs. 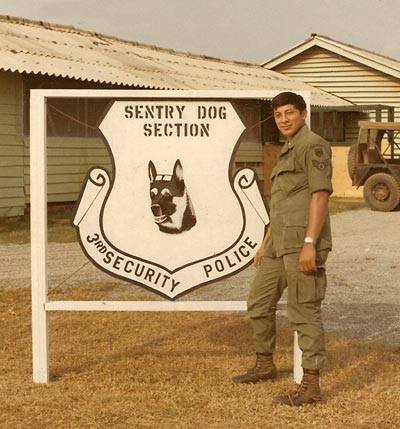 The success of sentry dogs was determined by the lack of successful penetration of bases in Vietnam and Thailand. 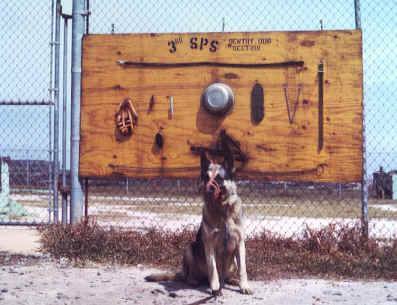 Sentry Dogs were also used by the Army, Navy, and Marines to protect the perimeter of large bases. 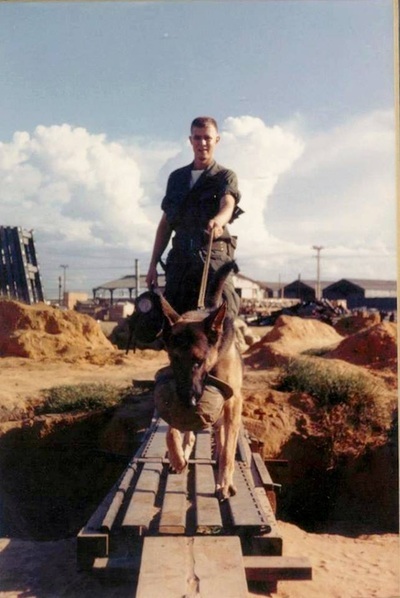 The Air Force soon had more dogs in SEA than all the stateside locations. 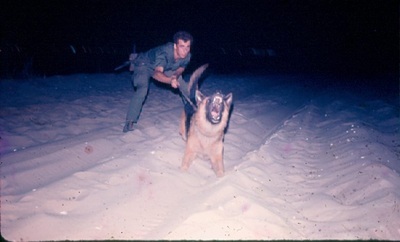 In the late 60s, handlers found themselves facing multiple tours. 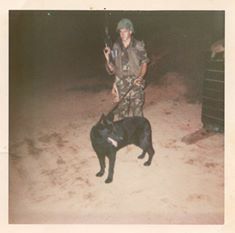 Many handlers completed a tour, rotated to a stateside base and in a few months had orders returning to Vietnam. 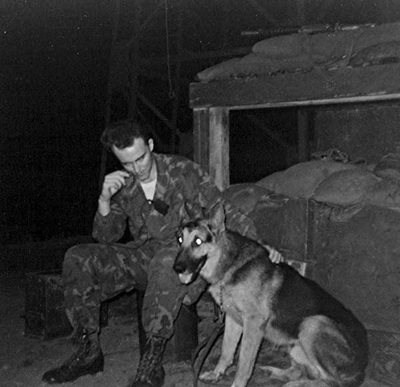 Often handlers received an assignment to Vietnam after completing a tour at another overseas base. By 1965, the increased of American involvement in the Vietnam War caused interest in use of scout dogs and later tracker dogs. Scout dogs had been so effective in WW II and Korea. 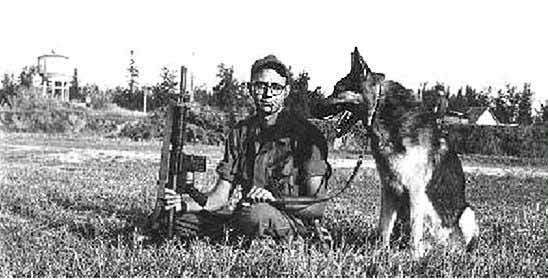 The scout dog program eventually ended up to consist of twenty two Army platoons and four Marine platoons. 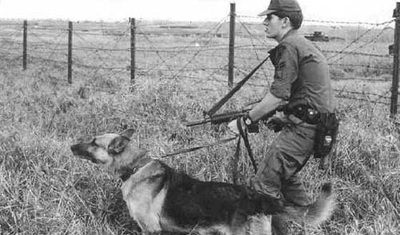 Scout dogs would alert if they see, hear, or smell enemy forces or booby traps. They will alert on scent that is airborne or scent that is located on the ground. Tracker dogs will only work on scent that is already on the ground. 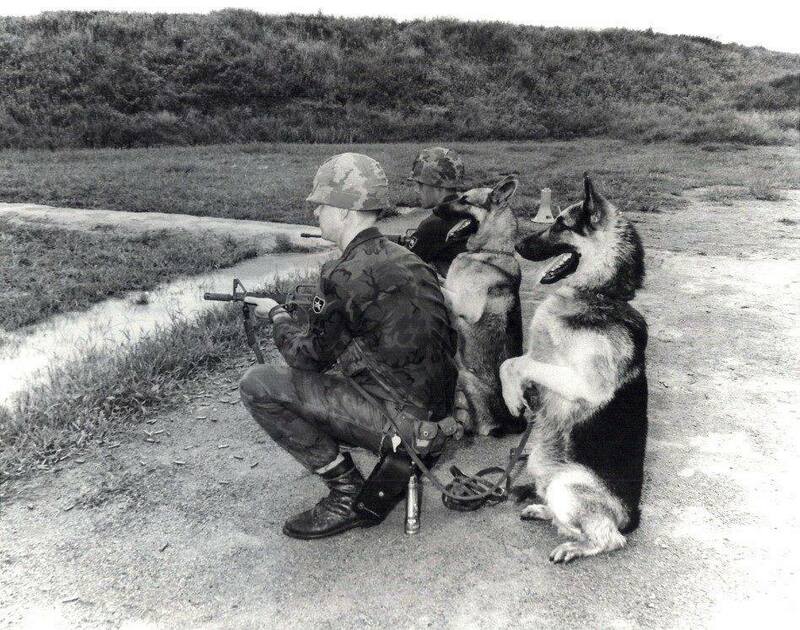 The dog must be given a starting point such as a foot print. 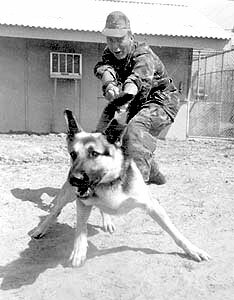 Both dogs are tolerant of other personnel and never trained to attack. Work safely in close proximity to friendly forces on strike teams, reconnaissance and ambush patrols without becoming distracted or agitated. 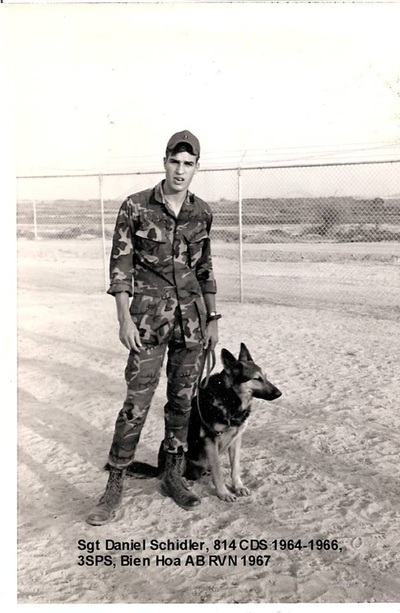 Accept a new handler with reduced training time. Safeside was a test program where scout dogs were used with infantry weapons and tactics by a specially trained Security Police unit. Over 4,000 dogs served our military in Southeast Asia. 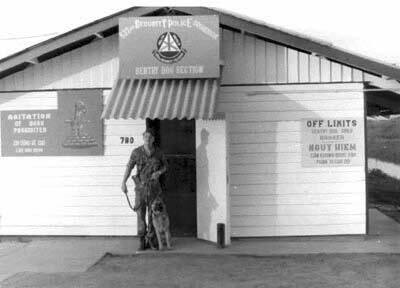 As American participation in the war ended, former bases were turned over to the Vietnamese Air Force. 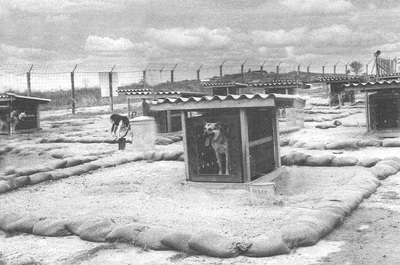 Dogs were treated as excess equipment. 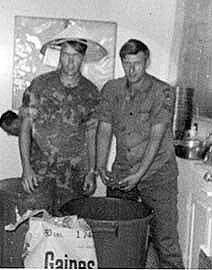 In some cases they were turned over to the Vietnamese military. The Vietnamese military never had an effective dog program. 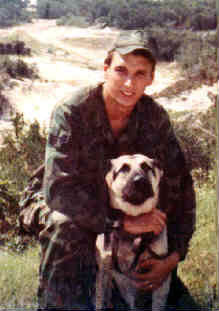 It cost more to feed a dog than it did to feed its Vietnamese handler. Plus, the average dog weighed 75 pounds and the average Vietnamese weighed 90 pounds. 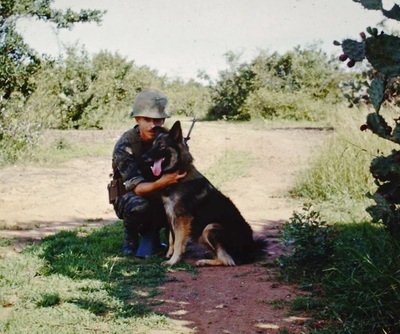 Rumors spread of military dogs being the main course at banquets. Dog meat is considered a delicacy in the Orient! Some dogs were shipped to the PACAF Dog School at Kadena Air Base, Okinawa, Japan. 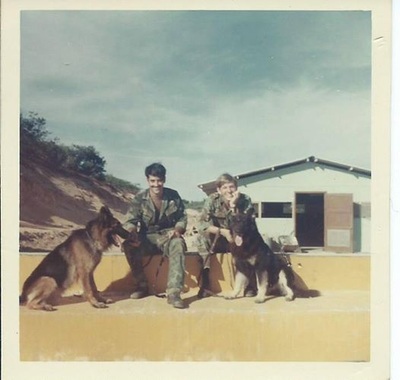 These lucky dogs were transferred to other bases in the Pacific area. Two shipments of dogs were made to the DOD Dog Center at Lackland AFB, Texas. 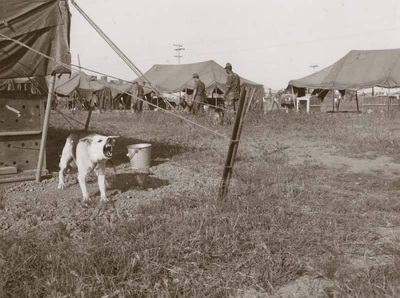 Dogs were shipped from base to base ahead of the base closures. But, it was soon the simple problem of too many dogs. Some excess dogs were reassigned to other Pacific bases, but most were killed. At the end of the American cavalry era, the Army disposed of its horses by machine-gunning them to death. 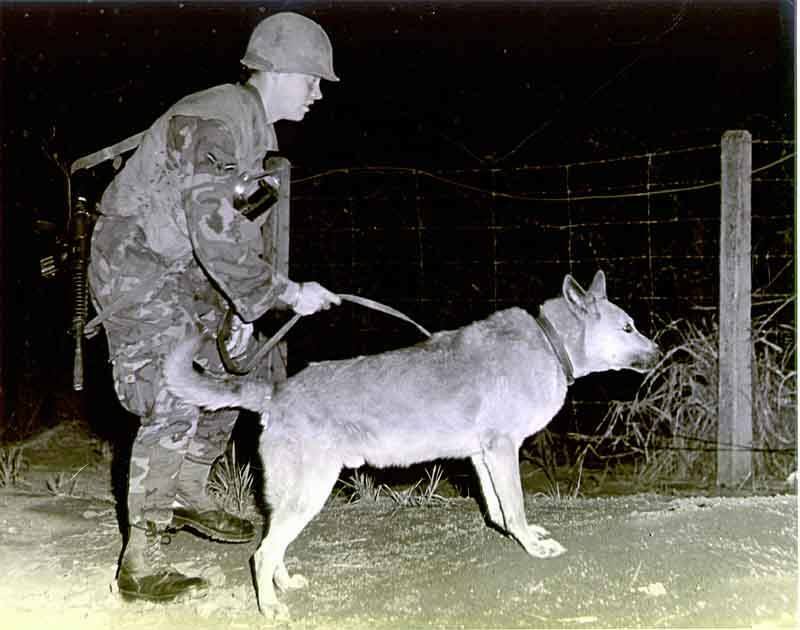 In our war, the dogs were also killed; only it was done in a more modern humane manner by a lethal drug overdose. The last American bases were in Thailand. Handlers from bases in Korea were sent TDY to assist in the base closures. 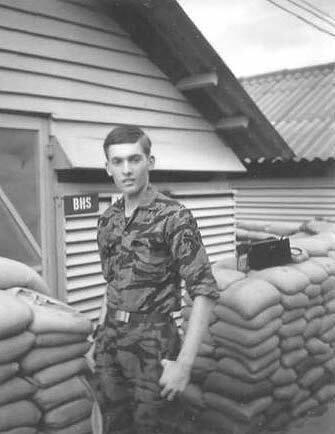 SSgt John Grammer was TDY to Korat Royal Thai Air Base. 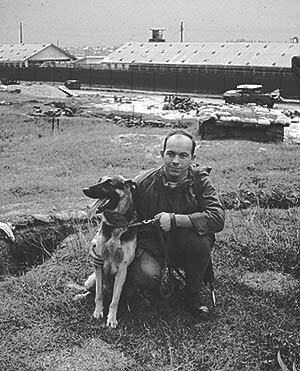 He reported that the veterinarian euthanized as many as six dogs every day, sometimes more, until they were all destroyed. PACAF combat aircraft flew their last strikes in Cambodia on August 15, 1973 and wrote the final chapter to the long, costly history of active American participation in the Indochina War. 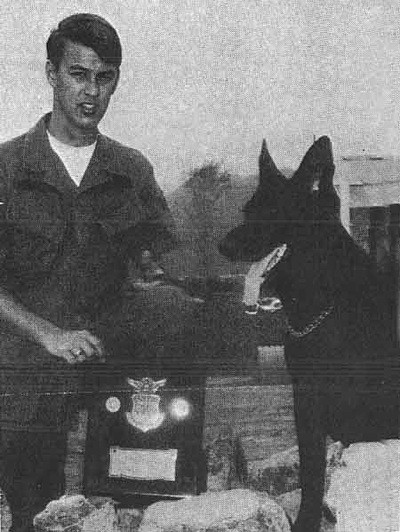 "K-9 Hero of Tan Son Nhut"
Nemo was whelped in October 1962. 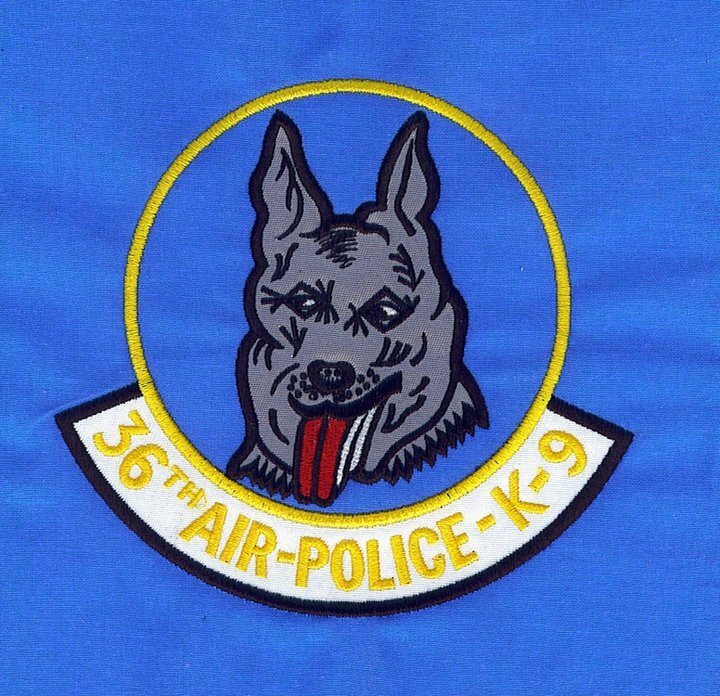 He was procured by the Air Force when he was one and a half years old. 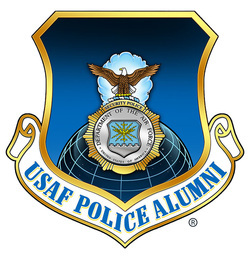 After completing an 8-week training course, he was assigned to Fairchild AFB, Washing, for duty with the Strategic Air Command. In January 1966, Nemo and his handler Airman Leonard Bryant, Jr., were transferred to the Republic of South Vietnam with a large group of other sentry dog teams. Airman Robert A. Thorneburg was assigned as Nemo's handler in July 1966. 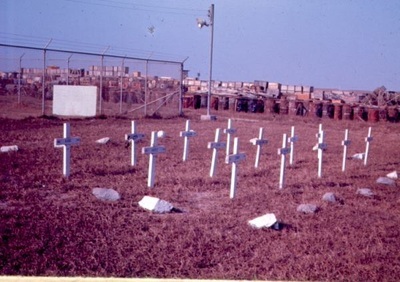 In the predawn hours of 4 December 1966, Tan Son Nhut AB Air Base was attacked by a large force of Viet Cong commando raiders who used a single avenue of approach through friendly force positions outside the base perimeter. Once inside the base, the raiders divided into small groups to attack their targets. 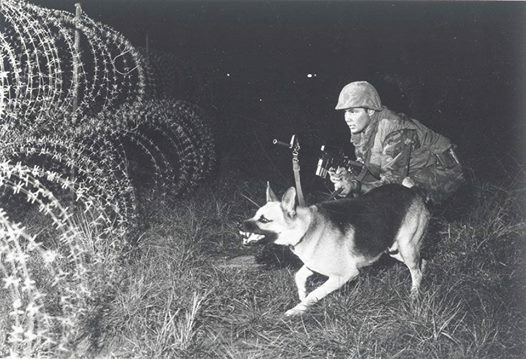 Several sentry dog teams stationed on preventive perimeter posts gave the initial alert and warning almost simultaneously. As a result of this early warning, security forces of the 377th Air Police Squadron successfully repelled the attack, minimizing damage to aircraft and facilities. 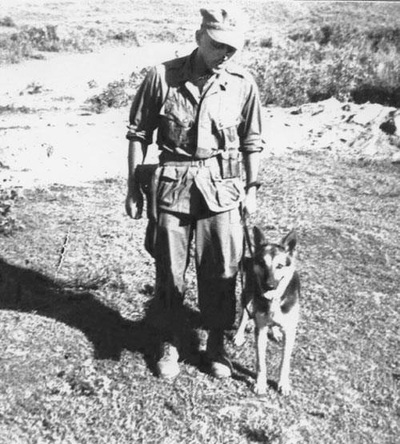 Although wounded, one dog handler maintained contact with the enemy and notified Central Security Control of their location and direction of travel. Two security policemen in a machine gun bunker were ready and waiting as the VC approached the main aircraft parking ramp. In a few seconds they stopped the enemy, killing all thirteen of the attackers. Security forces rapidly deployed around the perimeter and prevented numerous infiltrators from escaping, forcing them to hide in a Vietnamese graveyard, dense vegetation and wells. 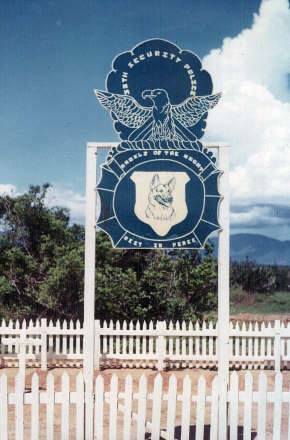 Search patrols believed that all remaining VC were killed or captured the following morning. 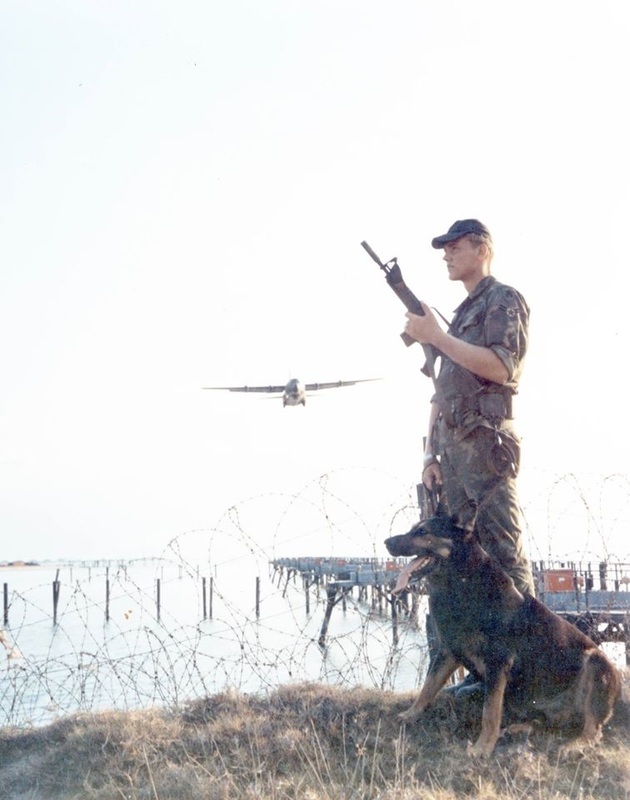 Unfortunately, supervisors did not include dog teams in those daylight patrols, so just before total darkness when Airman Thorneburg and Nemo were posted, Nemo alerted and was released to attack the VC who had evaded earlier detection. 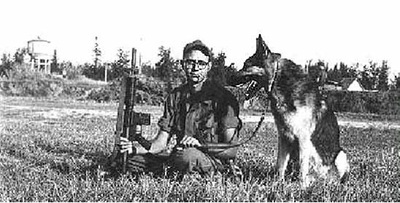 Both handler and dog were wounded, but not before killing at least one VC. Nemo's injuries included the loss of one eye. A sweep of the area by the Quick Reaction Team met with negative results. 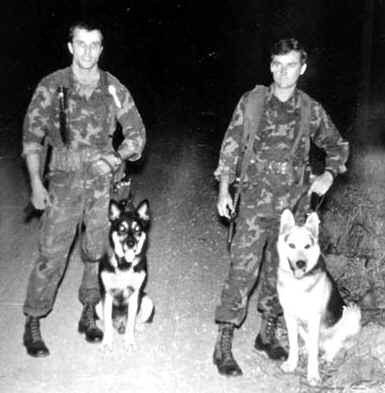 Using additional sentry dog teams, the security forces located and killed four more VC. A second sweep with the dog teams resulted in discovery of four more VC who were hiding underground. They too were killed. 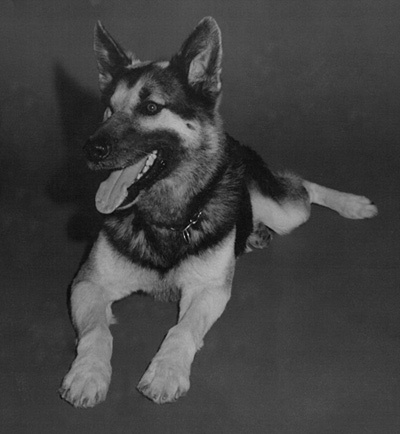 Nemo was credited with saving his handler's life and preventing further destruction of life and property. 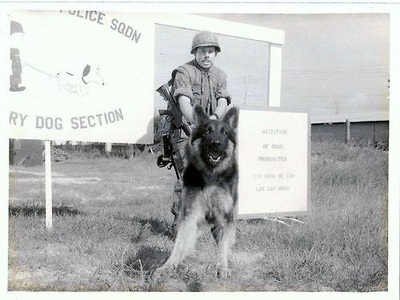 On 23 June 1967, Headquarters, USAF, directed that Nemo be returned to the United States as the first sentry dog officially retired from active service. 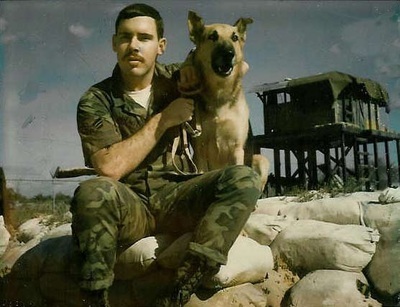 His permanent retirement kennel is located at the Department of Defense Dog Center, Lackland AFB, Texas. He is frequently taken on tours in the United States to assist the procurement of military working dogs. Excerpt from Air Force Manual 125-5, Volume II, dated April 28, 1972. 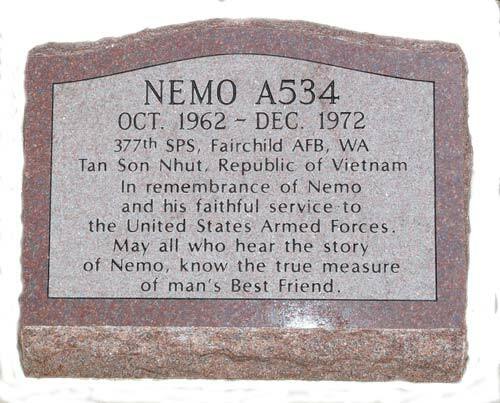 Nemo died from natural causes at Lackland AFB, Texas on March 15, 1973. Photo Above shows the terrible wound suffered by Nemo.
" 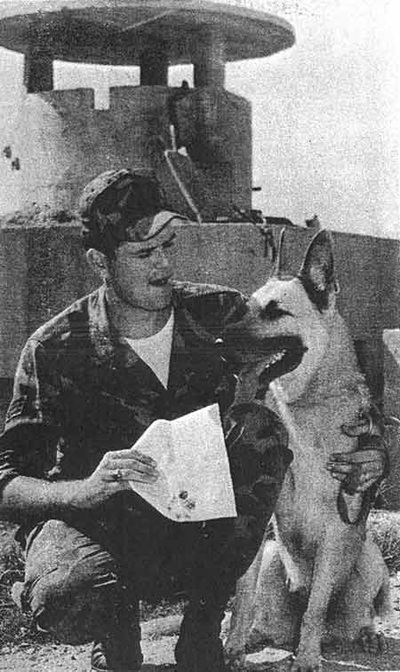 King, a two-year combat veteran sentry dog in Vietnam, gets a rewarding word from his handler, Sgt Paul F. Esser, New Orleans, a security police dog handler at Binh Thuy AB after the K-9 signed his Air Force Home Times News Release form with an inked paw. The 632nd Combat Support Group at Binh Thuy is the first unit to provide publicity to the dogs' hometowns to keep keep the family that donated the dog to the Air Force and local towns people informed on what their sentry dog is doing. " For more on the K-9 role in AE Asia, visit Monty Moore's Growl Pad over at www.VSPA.com. 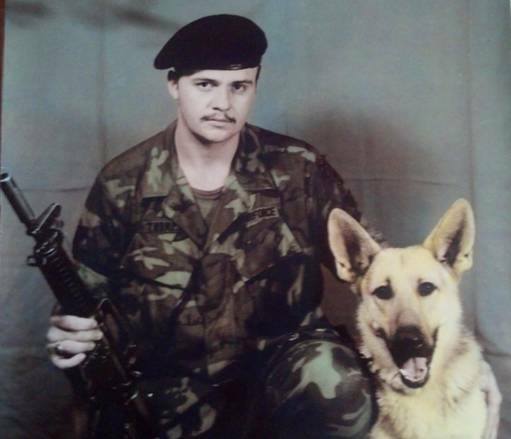 He maintains the K-9 section on the site and many of the photos displayed here he has collected. Yet the danger was always there. As into the jungle you'd stare. May last through out the entire night. 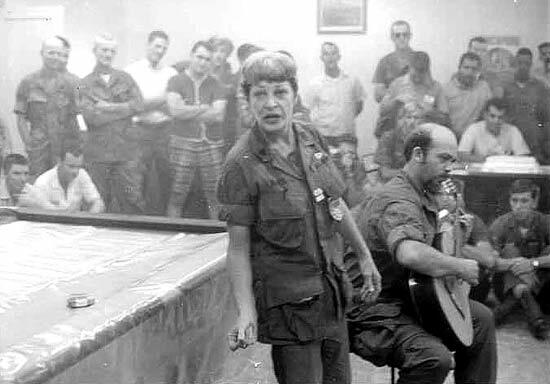 Announces that one of our other bases is in the fight. And quarter your post once more. And Charlie may be at our door. As we do what we are told. For he alone is courageous and bold. And the fear of death once again Is all that we are seeing. And hope for the best As off in the night we walk on. So tonight it's the same old song.